Of making your own stripes, is being able to have things work out just so—Perfectly matched stripes, and other details. 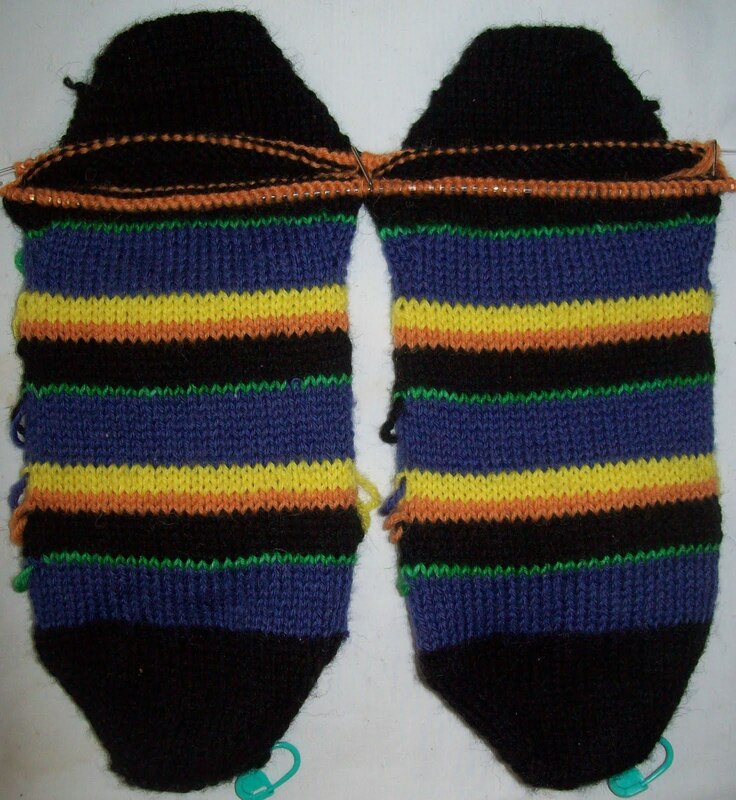 The heel (a short row one) has been knit in place—in the same black as the toe, and in the middle of the 5 row black stripe that fell at that point. I planned for a black toe, heel and cuff, but it was just good luck the striping worked out the way it did. Then another 2 R's of black (so there are a full five on the instep side) and the stripe pattern continues, in perfect order. The Candy Corn motif will start a few rows after the completion of the stripe rotation (ie, with the first row of the purple stripe) , to place it just above the ankle. It will be worked semi intarsia-- the leg will be worked flat--(that is it will be worked in knit and purl rows) but there won't be an open seam. At the end of each row, the yarns will be interlocked, intarsia style, (the 'seam as it were will be the edge of the candy corn motif,) and will be worked with a separate skein (bobbin) of yarn. I still haven't woven in any of the tails, (they are just tucked under the sock to make it look nicer). These socks, just like my socks with afterthought heels, have a small instep gusset for ease. The foot looks small (well it looks small to me!) but it is the standard 9 inches of foot that I need for a good fit. I know I didn't mention it,but these are bonus socks in a way. The purple, green, orange and yellow yarns are all left over colors from my Roy G Biv socks, only a single new skein, the black. Those are truly great socks! Thank you for that bit of advice.